It's now 11 billion miles from Earth. More than 40 years after lifting off from Kennedy Space Center, NASA’s Voyager 2 spacecraft is now in interstellar space. A region called the heliosphere surrounds the planets in our solar system. It’s essentially a massive bubble formed by solar wind — a constant stream of charged particles that emit from the Sun — hitting the matter and radiation that floats between solar systems in a galaxy. On November 5, Voyager 2 became the second human-made object to exit the heliosphere — but it’s already delivering first-of-its-kind insights into our universe. Voyager 2 now is slightly more than 18 billion kilometers (11 billion miles) from Earth. To put that in perspective, that distance is equivalent to more than 164 round-trip journeys between Mars and Earth. And while it might be the second spacecraft to reach this distance milestone, Voyager 2 has the potential to teach us far more than we could learn from its sibling craft, Voyager 1, which became the first to reach interstellar space in 2012. That’s thanks to the Plasma Science Experiment (PLS), an instrument designed to provide valuable data about the boundary between the heliosphere and interstellar space. 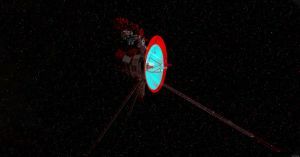 Voyager 1 also had a PLS onboard, but it failed long before the craft exited the heliosphere. Humanity is getting better and better at exploring the planets in our solar system and the star at the center of it. We can now listen to Mars, and we’re on track to “touch” the Sun by 2025. But this region accounts for just one very small part of the universe, and by extending our reach into the solar system with Voyager 2, we now have the opportunity to expand our understanding of the world beyond our little corner of space.